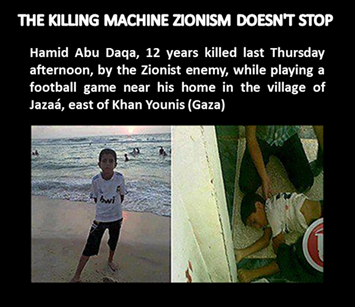 THE KILLING MACHINE ZIONISM DOESN’T STOP. 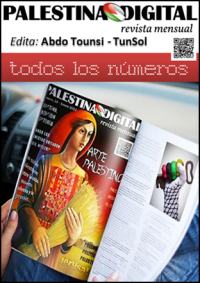 Today I write this story of the murder of the child Hamid at the hands of the killing machine Zionism, while playing football, a child football fan and supporter of Real Madrid. The story is going to help us by know it closely: first the tragedy of the Palestinian people to be threatened and the continued implementation of this killing machine called “Israel”, managed by the Sion-Monster from his cave. And secondly, to determine the degree to which it has come dehumanized the Godmother of the State by not taking a single action against him, on the contrary, a few days ago the European Union, its leaders fill their mouths talking about human rights signed a special treaty with that State trading murderer. Well, this is the story of the death and murder of Hamid, I say by to tell the truth and just in case reach the ears of the leaders dehumanized of the Zionist state Godmother. Hamid Abu Daqa, 12 years killed last Thursday afternoon, by the Zionist enemy, while playing a football game near his home in the village of Jazaá, east of Khan Younis (Gaza) The child Hamid was fan of the Real Madrid, was dressed in a shirt of this Madrid team and wore the number of Cristiano Ronaldo. The father said the child had passion for football, saw all Real Madrid matches on television, and I always asked to moderate this hobby for fear of diminishing school performance. Rest in peace our little martyr that his life was cut short for the sake of playing football in his village in Gaza. 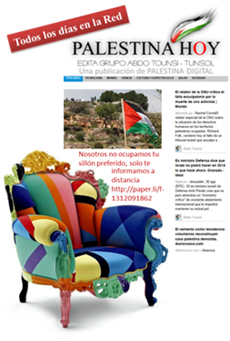 Esta entrada se publicó el 13/11/2012, 9:17 y se archivó como Crimes of Zionism, Human rights, Palestine. Puedes seguir cualquier respuesta a esta entrada a través de RSS 2.0. Puedes dejar una respuesta, o trackback desde tu propio sitio.